FriendFeed cofounder Paul Bucheit was recently asked what it was like to be the R&D department for Facebook. His response was appropriately humble, but you can’t help but wonder how long it will be before Facebook, Twitter and FriendFeed all start to look pretty much identical as the services simply copy the best features from their competitors. One thing is for sure, though: FriendFeed moves the fastest. They were the first to add comments to status updates, the first to bring in third party feeds and the first to realize the value of search. They also experimented with real time streams way before the others. So much of what they’ve done first has been copied by others – even Google has dipped into the well. Now FriendFeed is taking the next step in its evolution with a complete redesign and lots of new features. We were able to see a demo of the new site last week and have been testing it over the weekend. 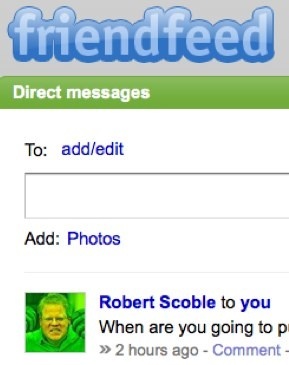 Our opinion: the new FriendFeed, which launches into beta today, is simpler, faster and better than the old FriendFeed. In fact, it may be a little too fast. The first thing you’ll notice is the new look of the site. The left sidebar is gone, and key information is in separate areas on the right. The main part of the page is now just for messages. It actually looks quite a bit like Twitter . The most noticeable new feature is real time streaming. The experiments from last year have now been pushed to every part of the site. 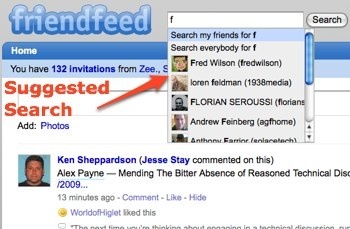 FriendFeed’s co-founder Bret Taylor says that by adding this functionality, FriendFeed can be used as a Gmail-like chat interface between one or many friends and is hoping to change the way FriendFeed is being used as a communications tool. Having a real-time feed of your friends’ and contacts’ status updates is really cool but watching the page constantly add updates gets a little annoying. As real time feeds come into your stream, it pushes what you are reading further down, which also can be a little annoying. FriendFeed has a solution for this: a pause button where your can turn the real-time updates off, and when off, the icon will tell you how many real-time updates are waiting to be added to your stream. The new interface also allows you to send direct messages and photos to your friends and lets you post these messages to Twitter. Another significant change to the interface is that service icons (the images that appear next to messages), have been changed from the source of the information (Twitter, RSS, Flickr, etc.) to the profile picture of the person who created the message. It makes it much easier to scan messages for interesting stuff. FriendFeed has added a number of features to promote interactivity between users including sharing features, where you can share a conversation, direct messages, feed, link, etc. to any number of your friends or one friend. The search filters have become more powerful, allowing you to filter searches by keyword or name or restrict searches to certain groups of friends or all of FriendFeed. And the search box will give you suggestions of your friends profiles, helping you to navigate to friend’s feeds easily. 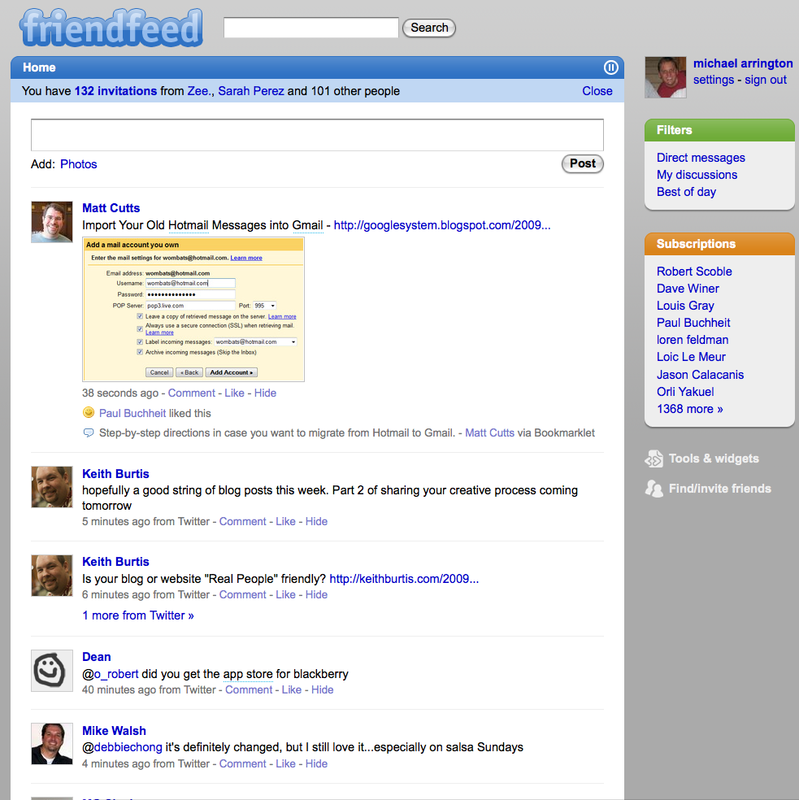 FriendFeed has also given you the ability to create a private “chat room” amongst your friends, dubbed “FriendFeed Feedback.” Similar to a group page, the private room feature let’s you create a feed that is restricted to a number of users, can be marked as public or private, and can be used as a communications tool to enable chats in a forum-like environment. These changes are all part of a new beta version of the service that users can opt into starting today. FriendFeed says they launched the interface in a beta format because they want to make adjustments to the interface as they receive feedback from users and plan to change the interface all together after they receive comments. FriendFeed has changed its interface and added new features previously, adding advanced search features earlier this year and creating a neat live blogging tool during the presidential campaigns last fall. Here’s a short version of the demo we saw last week. Robert Scoble has a longer version in HD as well.